Aaron Taylor-Johnson & Elizabeth Olsen Film 'Avengers' with a Bunch of Stunt Doubles! Elizabeth Olsen and Aaron Taylor-Johnson get into character while heading to the set for their movie The Avengers: Age of Ultron on Monday (June 23) in London, England. 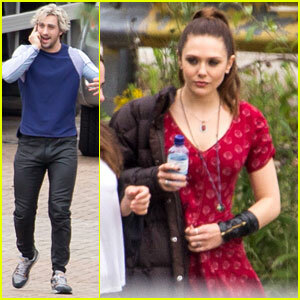 The stars, who play the sister-brother duo of Scarlet Witch and Quicksilver, were joined on set that day by a bunch of stunt doubles for characters such as Captain America, Thor, Black Widow, and more! You may recognize the stunt double for Thor as Bobby Holland Hanton, who was seen hanging out with Chris Hemsworth last month in London. Elizabeth Olsen Goes Simple & Chic For Critics' Choice Awards 2019! Sofia Vergara, Elizabeth Olsen & Jennifer Morrison Step Out for Brooks Brothers Holiday Celebration! Elizabeth Olsen Debuts New Bangs at Hamilton Awards! Keira Knightley Honored at Female Filmmaker Dinner at Toronto! 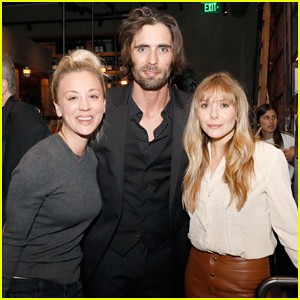 Elizabeth Olsen Reunites with Aaron Taylor Johnson at HFPA & InStyle's Toronto Party! Priyanka Chopra & Kate Bosworth Look Chic at Kate Spade NYFW Show 2018! Lea Michele's Favorite Day of the Year Arrived: Jennifer Klein's Day of Indulgence!